Hot Toys has released official photos and details for their upcoming Avengers: Endgame – 1/4 Scale Infinity Gauntlet Collectible. For the most part, this appears to be a very similar, if not the exact same, Gauntlet that was released for Avengers: Infinity War. There will be a new logo base featuring the Avengers: Endgame. The Infinity Gauntlet features light up Infinity Stones. While pricing hasn’t been revealed, their last 1/4 scale Infinity Gauntlet is priced about $95. Look for this to be released some time between the second and third quarters of 2019. <a href="https://www.facebook.com/media/set/?set=a.10156167466127344&#38;type=3&#38;__xts__%5B 0%5D=68.ARCJ85R_joSVcHplZKVbfAETwsikVeEodGXXJxdVQz lomELM0QPFtV7zDwjInmgtVdzLTp70Ar7aHx9KmUOr7myoGu5k vYdpYmNNBAfZb5GfDRKeUc7jeuzDrU3uNeGIHvKvpX1XdbWs9D tU0cxCsSI3OPE13ru_nSyYohrlmRZ7rqsVsglDto4sbPNzzCPX-1Pl3UGssEljTmANJnOFYgm2zcaKuSoGw3Rw1rjIluoAERJ58E6 Wve5RAI5glYyxfAHB1biwxXOsZPLFdyScSliZtpFIiLJ-wGIiiEaFNB2dm9-IwALpD-UwAnho8qlPtOfmCeFsKeBTaVNXIdpcx4L_mqliCy1b_5gTb5ar 2LWdC8pSb6tS0cXQ5AEaHAMVOll4dIIXjDzuTeO4AQtuldGxqe FlMTN-MuYlodhc-O-s_aamiUa9QEZyqmb8r4KV7Q&#38;__tn__=-UC-R">Avengers: Endgame Infinity Gauntlet 1/4th &#187; Continue Reading. 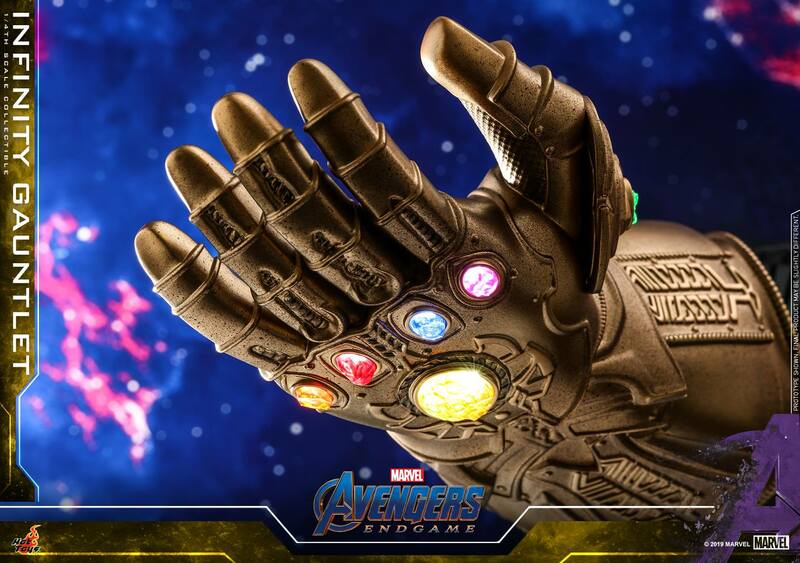 The post Avengers: Endgame – 1/4 Scale Infinity Gauntlet Collectible by Hot Toys appeared first on The Toyark - News.